Strong winds were hitting the state with 5 miles per hour reaching 30 miles per hours gusts of wind at times all throughout the day. Many large trees fell across roads. One home was cut in half by a 90 foot high tree falling on it. Two house trailers were destroyed by out of control brush fires. 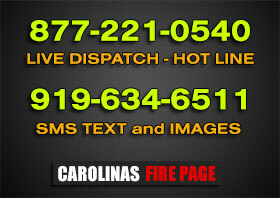 A family of five were left homeless from a fast moving house fire in West Mount, NC. Fire departments from West Mount Station 4, Sharpsburg Station 11, Coopers Station 15 and Nashville Station 14 along Nash EMS and Sheriff’s departments responded. Around 17.40 hours, units were dispatched to 8427 Bend of the River Road to a working fire in the home. The homeowners with their three children were able to get out of the burning home before firefighters arrived. Over 50 firefighters battled the blaze for over 1 1/2 hours before they could bring the fire under control . First-in firefighters made an aggressive interior attack but were forced out due to heavy fire conditions and part of the roof caved in forcing them to make an exterior attack using five hand lines and one deck gun. Two cars were in the back yard of the house; one was on fire. Firefighters were able to save one of the vehicles. Firefighters also saved a large storage building that was starting to burn. Firefighters were also fighting the high winds blowing all day long that helped fan the blaze. Crews remained on the scene for extensive overhaul. No injuries were reported.